In this blog series going over the most common eye issues, we’re going to be discussing cataracts. The first blog of the series went over open-angle and angle-closure glaucoma. Check back soon to learn more about macular degeneration, diabetic retinopathy, and refractive errors. The ophthalmologist Dr. Sina understands that struggling with an eye disease can be incredibly scary and overwhelming. But he also understands the importance of compassionate care and the calm that can sometimes come with a knowledge of the disease and the potential treatment. If you are aware of a risk of developing one of these issues, or if you are experiencing problems with your vision, schedule an appointment with Dr. Sina today in Alexandria. Despite many people believing that cataracts are a film that develops on the eye’s lens, it actually forms inside the eye. Your eye’s lens helps you focus light or images on the retina, which is a tissue at the back of your eye. When cataracts are developing, the proteins of the lens are breaking down, which results in a haze that distorts vision. Even though age-related cataracts are most common, they can still develop if you have experienced an accident or if you are recovering from another eye problem, such as glaucoma. Other factors that increase the risk of cataracts are exposure to the sun, which can speed up the breakdown of the proteins. Cataracts are sometimes congenital and babies are sometimes born with them. There may be an increased glare from headlights and lamps. Halos may appear around lights. Changes in prescription may be needed more frequently. 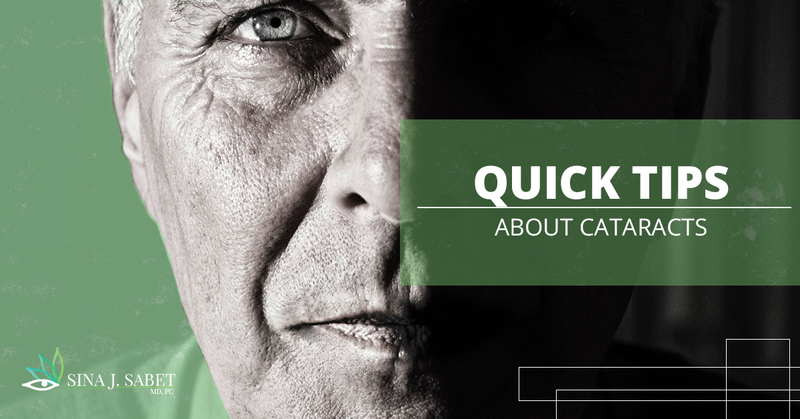 On the surface, cataracts may sound like a serious issue. But oftentimes, symptoms aren’t bad enough to warrant having surgery. Cataracts develop slowly and the symptoms that are present can be fixed by updating your glasses or contact lens prescription. If you continue to visit with an ophthalmologist to get an update on your eyes, and symptoms aren’t affecting your quality of life, it’s safe to put off surgery. But it is incredibly important to keep your eye doctor visits. Cataracts are possibly the most common eye issue, but the good news is that they typically the easiest, and safest, to treat. 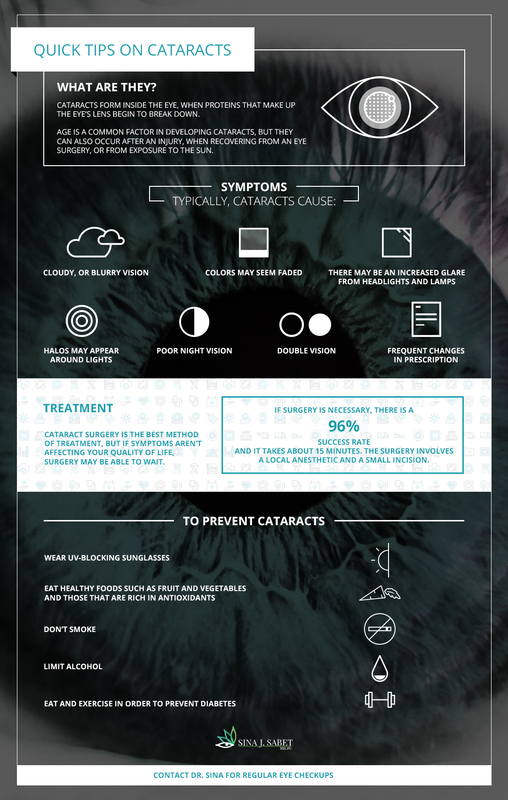 If your cataracts do require surgery, you can rest assured knowing that there is a 96 percent success rate. The surgery only takes around 15 minutes and involves a local anesthetic and a small incision. Your ophthalmologist will remove the lens to clear out the eye and will then insert a lens implant. While you can’t completely prevent cataracts from developing, there are a variety of ways to protect your eyes, and all of them will help. Eat healthy foods such as fruit and vegetables and those that are rich in antioxidants. Eat and exercise in order to prevent diabetes. There are quite a few people who develop cataracts, but with regular visits to your ophthalmologist, it can be detected early. If you are concerned about your vision and eye health, get in touch with Dr. Sina today.